Welcome to the most comprehensive Landscape/Hardscape Blog! How Mighty is the Oak? The Mighty Oak is one the BEST trees to plant in a home landscape. It grows fast in spite of the slow growing reputation. 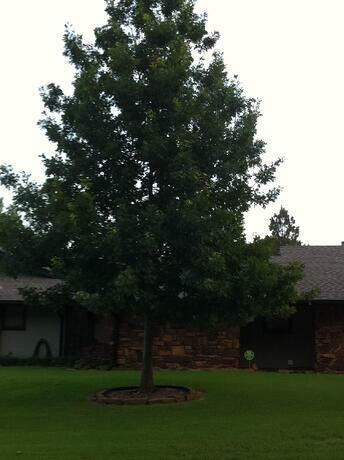 Tulsa Landscape has planted many vareities but our favorite choice is the Shumard Red Oak. 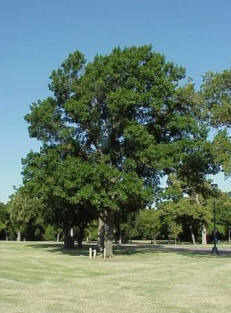 KRMG Radio Garden Show host, Allan Storjohann, lists the Shumard Red Oak as one of his top ten choices for a great tree in Oklahoma. Low maintenance needs, not soil type sensative, and easy to establish are some of the trees best traits. James Berry of Sanders Nursery said that the Shumard Oak should be used much more. It is a big seller. Oklahoma State University strongly recommends the Shumard because "it tolerates a wide range of conditions. Great for the Urban Landscape". Similar to the Northern Red Oak in form and detail, The Shumard Red Oak is a great choice. Why? I planted this tree in the Fall of 2007 as a eight foot tall specimen in a 15 gallon container. This photo was taken in Spring of 2011 and measured 24 feet tall and 13 feet wide. Surprisingly, the lawn in their yard does not have an irrigation system. The soil is a very poor clay type. The only care it has received is a water & fertilizer when the lawn gets it. In other words, it has just been left alone. You can't beat that for a great tree. I like this Specimen for a Street tree due to the upright nature. It works well for a large tree in a smaller lot which is common today. With its fast growth, it is easy to limb up so you can walk under the canopy after just a few years. It does not produce acorns every year. Shumard does not present chlorosis (yellowing) as some varieties like the Pin Oak. Fall colors can be reddish-yellow most years. This is a no-brainer. Consider the Shumard Oak. You will not be disappointed.